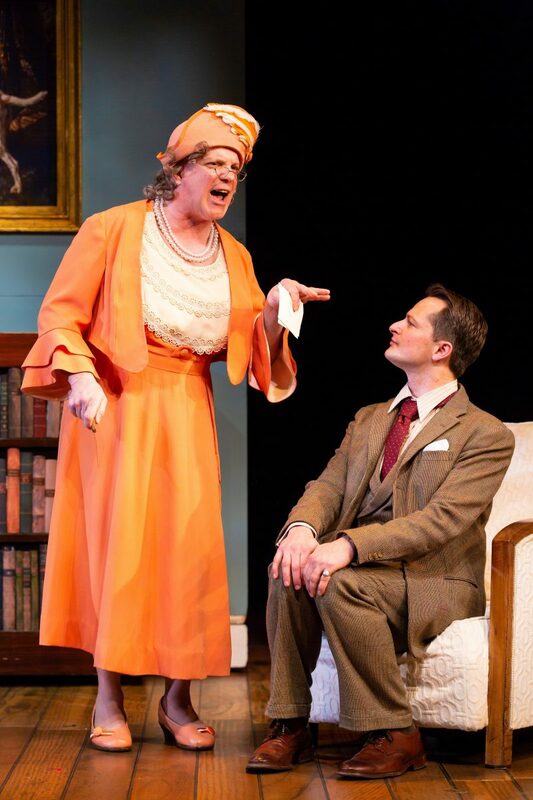 Arnie Burton in Jeeves and Wooster in “Perfect Nonsense” at Hartford Stage. Photo by T. Charles Erickson. In our divisive and troubling times, it’s so wonderful to have a couple of hours of comic relief that Jeeves and Wooster in “Perfect Nonsense” so adequately provides, with inventive characters, staging, production values and performances. 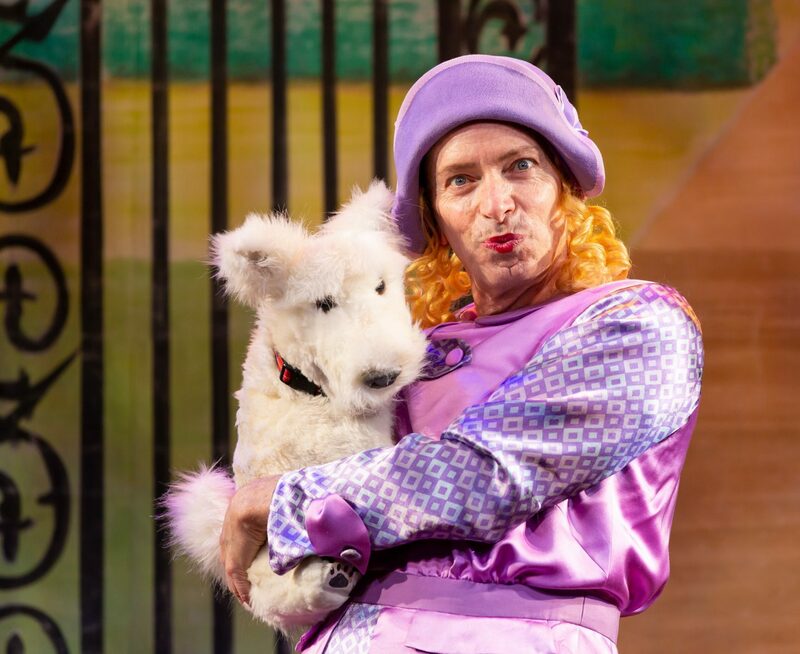 If you’ve seen Michael Frayn’s frenetically zany Noises Off, or the current Broadway hit The Play That Goes Wrong, whose national tour had audiences rolling in the aisles at The Bushnell, you’ve seen madcap British comedy at its onstage best. British humor gets laughs on TV and on screen too. P.G. 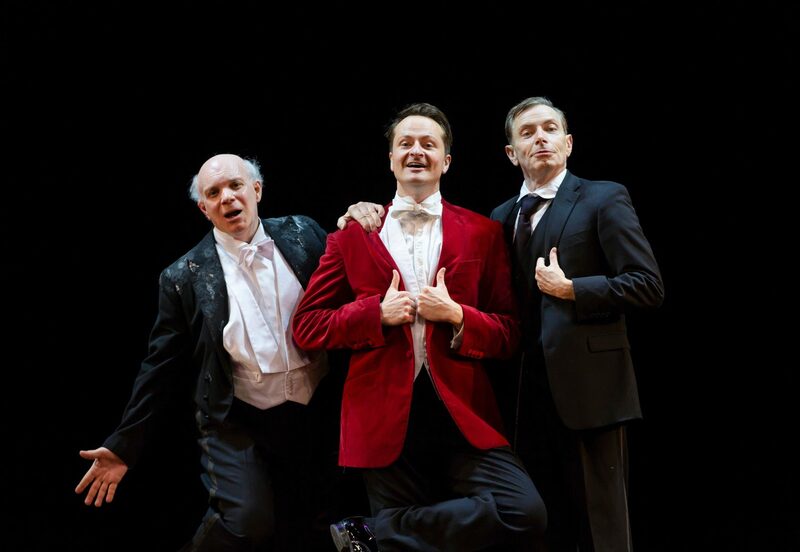 Wodehouse was the master British humorist of the early 20th century, and from his beloved The Code of the Woosters comes Jeeves and Wooster in “Perfect Nonsense”, the new laugh-filled comedy at Hartford Stage. Jeeves and Wooster in “Perfect Nonsense” is a huge London hit, and an Olivier Award winner, and its London director, Sean Foley is helming this production, which is making its American premiere in Hartford. P.G. Wodehouse was an early 20th century British writer and humorist, whose characters Wooster and Jeeves were comedy classics. Wodehouse also spent time on Broadway, collaborating with Guy Bolton and Jerome Kern on the musical, Very Good Eddie, and later, Leave it to Jane. Very Good Eddie made it to Broadway in 1975, after a production at Goodspeed Musicals. Incidentally, Andrew Lloyd Webber and Alan Ayckbourn musicalized Wodehouse’s characters, the bumbling socialite Wooster and his competent valet Jeeves in a show called By Jeeves, a short-lived musical that was revised for presentation at Goodspeed. The Goodale Brothers have written a taut play, which director Sean Foley has staged with adept cleverness. There’s a lot of physical comedy, slamming doors, sight gags, double takes, an shtick, which had the audience convulsing in laughter from the opening through the standing ovation at curtain call. Alice Power’s sets and costume designs, equally clever, are comedic as well, and they’re lit to perfection by Philip Rosenberg. Jon Gromada’s sound design, especially the onstage sound effects are timed to the second, and they’re hilarious. Eddie Korbich and Chandler Williams in Jeeves and Wooster in “Perfect Nonsense” at Hartford Stage. Photo by T. Charles Erickson. The three actors, Arnie Burton, Eddie Korbich, Chandler Williams, play multiple characters, male and female, sporting a variety of British accents. They excel at their quick change of characters, the dexterity of Foley’s very physical staging and choreographer Adam Cates’ challenging footwork. Individually, they’re tour-de-force. Together, as an ensemble, they’re as well-oiled as a Swiss watch. When the reviews come out, I suspect that Jeeves and Wooster in “Perfect Nonsense” will become the hot ticket. Performances run through April 20, before Hartford Stage launches the world premiere of a new musical, The Flamingo Kid, which also ends the fabulous tenure of Artistic Director Darko Trenjak. Hartford Stage presents Jeeves and Wooster in “Perfect Nonsense” by The Goodale Brothers. Directed by Sean Foley. Scenic and costume design by Alice Power. Lighting design by Philip Rosenberg. Sound design by John Gromada. Choreography by Adam Cates. Cast: Arnie Burton, Eddie Korbich, Chandler Williams, .through April 20.. Hartford Stage, 50 Church Street, Hartford, CT. 860-527-5151 or www.hartfordstage.org. Mark G. Auerbach studied theatre at American University and the Yale School of Drama. He’s worked for arts organizations and reported on theatre for newspapers and radio. Mark produces and hosts ArtsBeat Radio on 89.5fm/WSKB Radio.